Shanghai International Restaurant & Catering Show, Shanghai International Catering and Ingredients Exhibition (SHICAI), Shanghai International Condiments & Food Ingredients Exhibition (CFIE), Shanghai Catering Chain Franchise and Digital Management Exhibition, and Shanghai International Frozen and Chilled Food Expo (SIFCE) jointly organized by ITE Asia Exhibitions Limited, Shanghai Gehua Exhibition Planning Co., Ltd., Shanghai ITE Gehua Exhibition Service Co., Ltd., Shanghai Restaurants Cuisine Association, Shanghai Frozen Food Trade Association and Condiments Committee of Shanghai Food Association will be held in Shanghai New International Expo Center concurrently with the World Seafood Shanghai (SIFSE) and Shanghai International Aquaculture Exhibition during August 19-21, 2017. As a renowned catering and ingredients show in the industry, the event has many highlights. The exhibition this year boasts a much larger scale than any previous ones, covering an area of 58,000 square meters, and attracting close to 1,000 exhibitors at home and broad including famous brands and manufacturers. Themed on "A collection of the finest Ingredients · Leading Industry-leading Development", the exhibition has been further divided into several sections by category in five halls with optimized structure of exhibits. 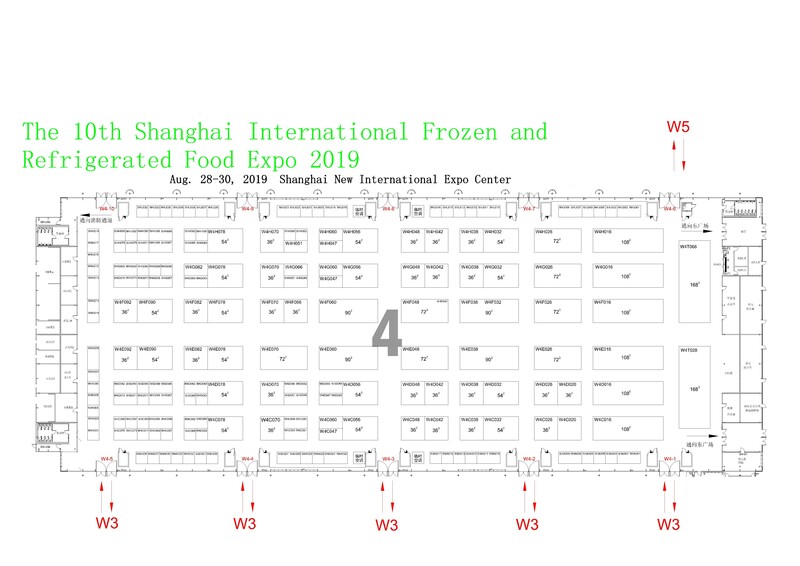 Among these exhibitions, SHICAI and SIFCE in Halls W4 and W5 cover all kinds of products throughout the food ingredients industry chain and gather a number of domestic top-class brands including Sanquan Longfeng, Leyaoju, Shanghai Lianhao, Fuzhou Zhengdian, Zhengzhou FB Yusheng, Yihai Haidilao, Shandong SpringSnow, Foshan Pingroun, Henan Yongda, Weifang Mechain, Jiangsu Hexian Group, Fujian Haixin, Hunan Xincongchu and Guangzhou Jiahao. Meanwhile, CFIE in Hall W3 covers all kinds of Chinese condiments, Western condiments, food-related ingredients, additives and packaging equipment. With the leap in growth of the condiment market and continuous support from all walks of life, the event has attracted top brands such as Totole, McCormicK, Flavor Full, Dingfeng, and Kewpie for participation, facilitating the trade docking between condiment manufacturers and ingredients manufacturers. In addition to condiments and food equipment, Shanghai Catering Chain Franchise and Digital Management Exhibition, as one of the catering ingredients serial exhibitions, brings together a batch of renowned enterprises including Weizhiwei, Tea & Brown, New Partner, Qiandaodao, Wuxi Liufu, Who's Tea, Oolong Tea, Green Way, Hanbee Matcha, Hangzhou Beverage Investment, Yuzhi Matcha and Nana’s Green Tea. The special-subject exhibition not only strengthens the communication, exchanges and cooperation between enterprises and across industries, but also builds a cutting-edge brand promotion platform both at home and abroad for enterprises to develop multi-level markets. Furthermore, the concurrently-held SIFSE has gone through 12 years now since its establishment. As one of the most internationalized exhibition platforms in China, the SIFSE has received the enterprises from 20 foreign countries including the United States, South Korea, Ecuador, Canada, France, Norway, Vietnam, Iceland, Chile, Pakistan, Spain, Argentina, Thailand, New Zealand, Japan, Russia, Denmark, Holland and Australia. On the first day of the exhibition, at Area C of Hall W5, “Global Beef & Catering Supply Chain Forum and Tasting Session” will be held, where guests including American exporter representatives, chairmen of listed beef enterprises and investment & financing institutions will be invited to talk about the latest beef import situation and development; at Area D of Hall W5, “Cooking Contest of Cold Dishes” brings star chefs from across the country together to demonstrate skills and learn from each other; and “Excellent Suppliers Selection and Award Ceremony” will hold a grand award ceremony on the platform for the opening ceremony on the first day of the exhibition. On August 20, at Area C of Hall W5, "Innovative Catering Summit", a forum on efficiency for the B end catering chain, will analyze hot topics like Internet+, brand, takeaways, business model and marketing; while at M4 conference room of Hall W3, "Condiments Technical Forum" will analyze industry development trends and policy interpretation. The exhibition will kick off soon and get together industry association leaders, catering alliances, catering industry leaders, supply chain platforms, shopping malls, supermarkets and restaurants, purchasers, E-commerce platforms, importers & exporters, distributors and relevant media. The catering gala welcomes you during August 19-21.